6M x Germany - interesting lot packed in a carton with plenty of better issues. As well Berlin monetary sovenier sheet, German Reich Ostropa souvenir sheet twice (as usual with faults), as well an interesting part French zone and Saar. Perfect for liquidation! 7K ⊙/ Germany - rich collection in the spring back binder accommodated, as well a strong part German Reich with many better breast shield stamps, as well Weimar and Third Reich, Saar and further areas. Enormous catalog value! 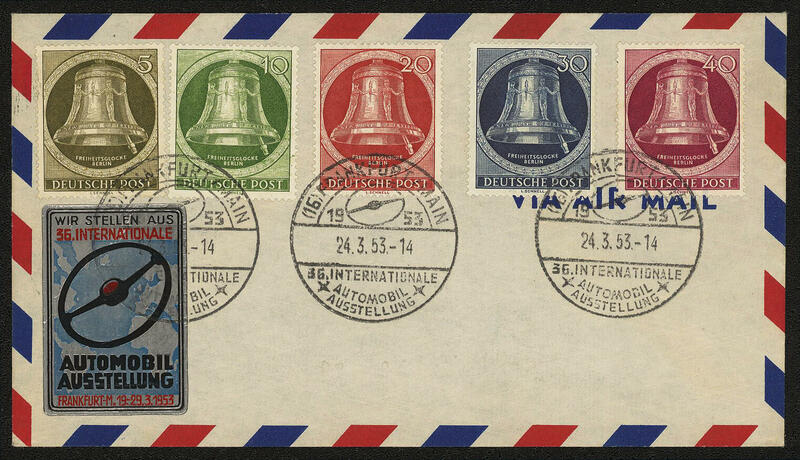 7L /⊙/ Germany - rich collection in the spring back binder including numerous better issues, as well allied occupation and American/British Zone represented strongly, Berlin much more than complete including the early key values. A rich object, favorable valued! 9M Germany - nice mint never hinged collection in the spring back binder, as well allied occupation, American/British Zone with 2 Pfg. - 5 DM buildings wide perforated, 1 - 5 DM high stair, 2 Pfg. 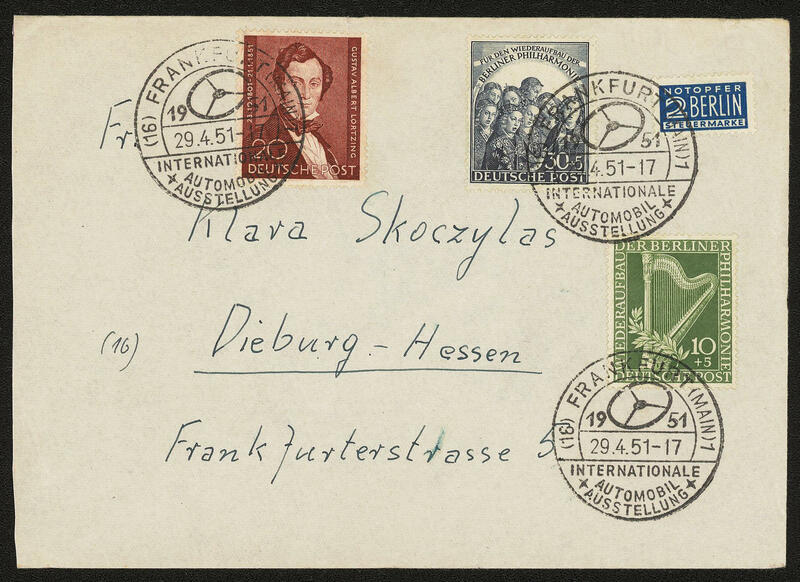 - 1 DM close perforated, as well Federal Republic of Germany from 1949 / 56 complete mint never hinged including posthorn set. Favorable! 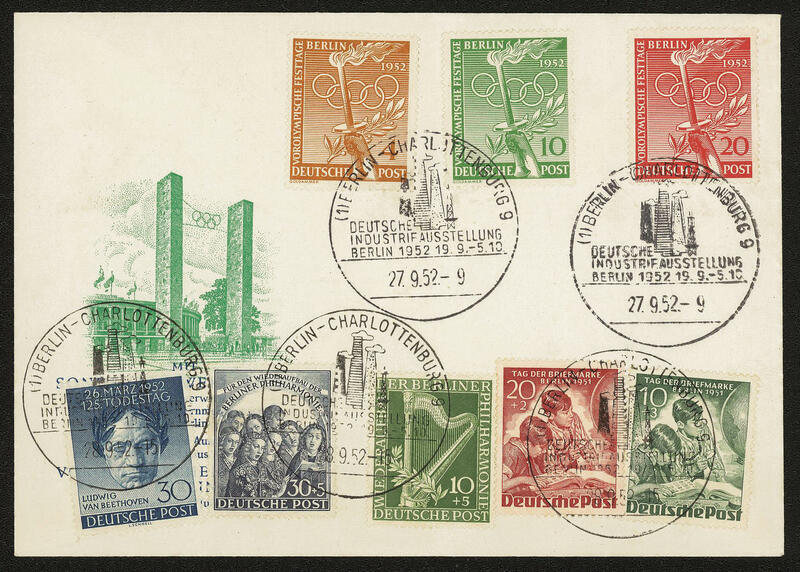 11P /⊙/ Germany - interesting lot in the ring binder, as well mounted on pages. As well French zone in the number of a major listing complete including Constance II, numerous further issues French zone, New Saar, Soviet Zone Goethe souvenir sheet and so on. Please have a look! 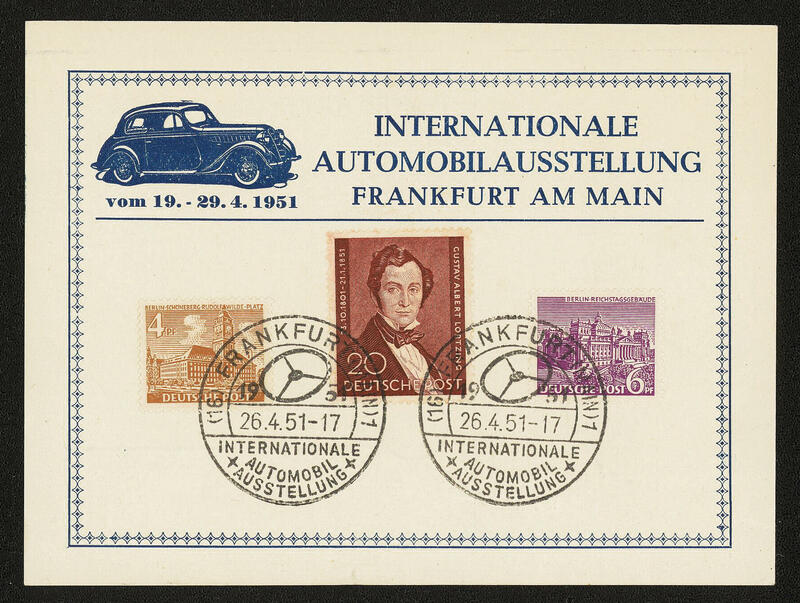 11Q ⊙/✉ Germany - rich collection in two albums accommodated. As well an extensive used collection French zone, herewith the red cross souvenir sheets from Baden and Wuerttemberg expertized Schlegel BPP, Federal Republic of Germany with first issues, allied occupation help for the aged souvenir sheet pair with special cancel, American/British Zone, Berlin with better values, as well also a collection postal stationery Federal Republic of Germany with early issues. Magnificent object! 20E /⊙/ Germany - interesting lot in the ring binder, as well an extensive part German Reich including better issues as for instance Pair of olympia souvenir sheets, Nürburgring, much mint never hinged material Third Reich, also Old German States and so on. Very favorable! 20J x Germany - interesting inventory in 23 approval books accommodated, mostly very well-filled, as well interesting issues including a good part Old German States, German Reich well represented, as well also postwar Germany. Enormously trade value. Very favorable! 40 /⊙ Germany - nice collection in the safe ring binder with a lot of better issues. As well allied occupation help for the aged souvenir sheet pair with special cancel expertized Schlegel BPP, an extensive part American/British Zone including export fair souvenir sheet, French zone in the number of a major listing complete, as well an extensive part Soviet Zone including bridge building souvenir sheet, Goethe souvenir sheet 1949 and so on. Nice collection! 51 ✉ Germany - interesting lot of approximate 70 documents. As well an interesting part French zone generally issue including one complete set franking on registered cover and so on. Favorable! 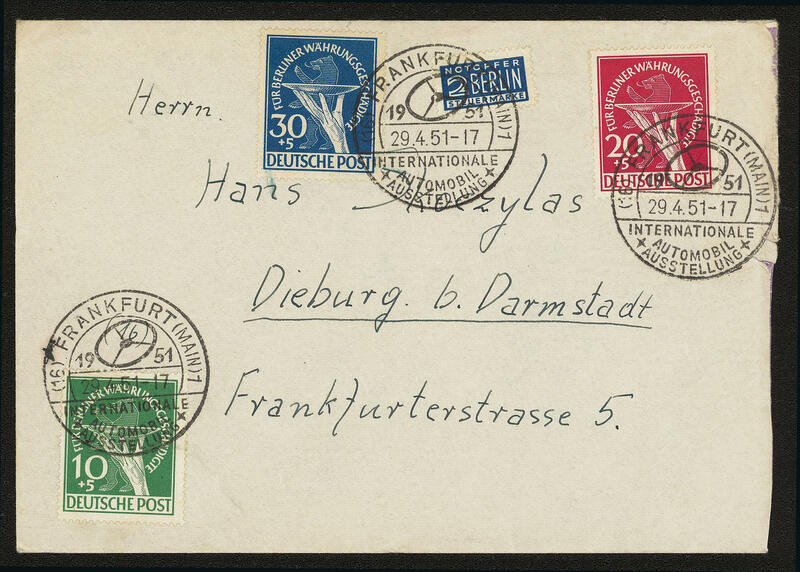 69 ✉ Germany - interesting and rich collection from covers and cards in four large stock books formed. As well numerous better documents from Old German States, good frankings and so on. With also Berlin monetary reform vitims 1949 as set franking, memorial church with additional franking on air mail letter to the United States, philharmonic and Day of the Postage Stamp with an additional additional franking on beautiful illustrated cover, Federal Republic of Germany with useful issues of the early years on covers and covers including 100 years stamps, Stephan, Bach seals on blanco card, German Demokratic Republik (East Germany) German Chinese friendship complete on registered cover and so on. A versatile object, perfect for liquidation! 98L /⊙/ Germany - rich collection in four albums accommodated. As well New Saar including flood souvenir sheet pair, allied occupation / American/British Zone, Federal Republic of Germany used with the first issues, as well an extensive used collection Berlin with good beginning valued including monetary reform vitims set expertized Schlegel BPP. Very high catalog value! 98P x Germany - extensive inventory from a dealers stock packed in a carton with lots of material on stock cards and in bags, all Germany. This includes many interesting issues, numerous specialties and so on. Treasure trove and perfect for liquidation on the internet and so on. Suited! 293 ⊙/ Germany - collections of different areas in three Schaubek illustrated albums, as well Gdansk with different issues including special- and commemorative values, Saar, allied occupation help for the aged souvenir sheet pair mint never hinged, numerals stamp booklet mint never hinged and further areas. Favorable! 324 x Germany - extensive lot on stock cards with a lot of material from the German Reich to postwar Germany, enormous catalog value, treasure trove. Enormous catalog value, treasure trove! 326 /⊙/ Germany - interesting collection in six speaking Behrens-albums formed. As well better issues as for instance Federal Republic of Germany with Lower House of German Parliament 1949, Stephan, St. MaryÂ´s Church, transport exhibition 1953, Berlin with black overprint stamps, 1-2 DM Stephan, Goethe set, bells issues, German Demokratic Republik (East Germany) academy 1950, German Chinese friendship and many further better issues. Very favorable! 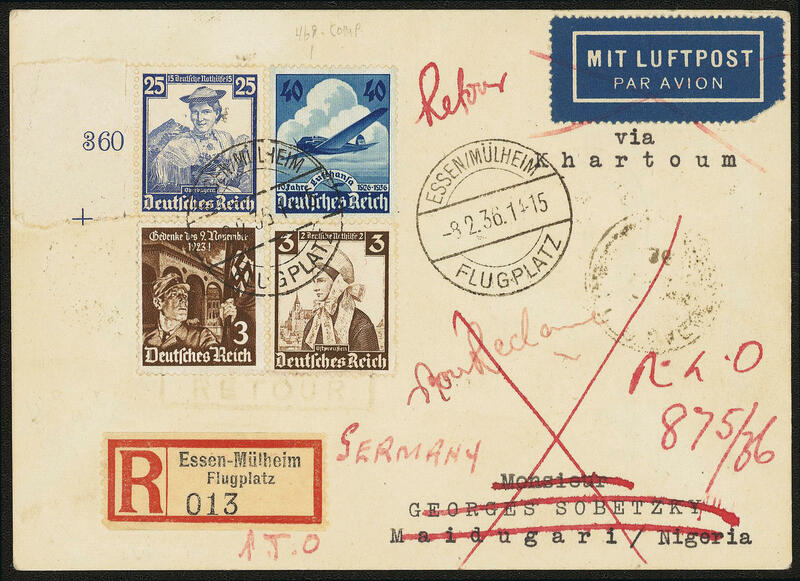 342 ⊙/ / Germany - extensive used collection in the spring back binder with the areas allied occupation, American/British Zone, French zone, as well Federal Republic of Germany with useful first issues, slightly mixed condition, mainly used collected. With also Lower House of German Parliament 1949, Stephan, 100 years stamps, 30 Pfg. Welfare 1949, Bach seals, 20 Pfg. St. MaryÂ´s Church, Wuppertal set, welfare 1951 / 52 and much further material. Favorable valued! 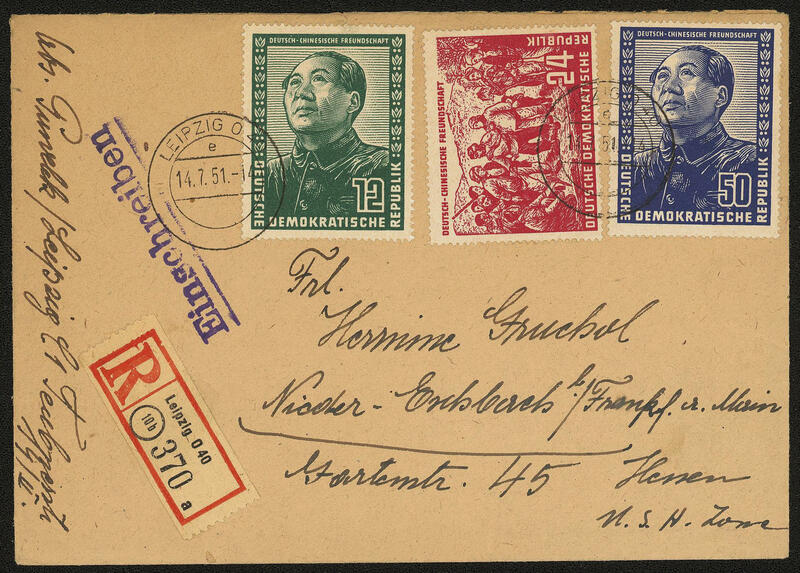 346 x Germany - interesting and extensive inventory packed in a carton with numerous issues on stock cards and in glassine-bags from the German Reich until the post-war period. Extensive treasure trove! 369 /⊙/ Germany - extensive inventory in seven large stock books accommodated with a large amount of material. As well an extensive lot German Demokratic Republik (East Germany) including lots of mint never hinged material, as well a large number complete sets and souvenir sheets, Federal Republic of Germany beginning years with better values as for instance welfare 1949, transport exhibition 1953 twice, welfare 1953 twice, Ifraba 1953, an extensive part Saar, much French zone and so on. Very favorable! 372 /⊙/ Germany - extensive lot, in stock created in a large stockbook, often stacked closely one above the other. 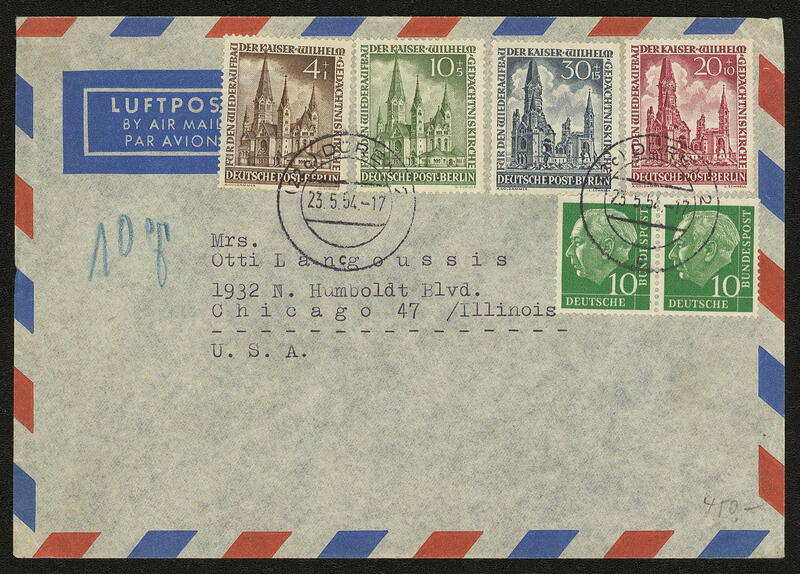 As well an extensive part French zone, American/British Zone first issue of stamps for Germany after WW II., ribbon and net overprints, as well buildings. Enormous catalog value!